It’s common sense that keyword research is the foundation of any SEO campaign. After all, how could you optimize a page if you don’t know what search terms you’re trying to rank for? The trick, of course, is how to find the most effective keywords to target. If traffic is what brings in visitors, and visitors bring in dollars, shouldn’t you optimize for keywords that will bring in the most traffic? The foundation of search marketing starts with keyword research, and you’d be an absolute fool to ignore it. There’s no need to over-complicate it. But to be fair, the search engine optimization landscape is in a constant state of flux. Competition, content quality, and algorithm updates can all have an impact on any given approach to SEO’s effectiveness. That’s why we’ve put together this guide to cover the basics. of keyword research. Can’t We Just Skip the Research Part? In a perfect world, sure. But the truth is, more traffic doesn’t unequivocally mean more revenue. Not all traffic sources are created equal. The same holds true for keywords. There are a number of factors that need to be taken into account when considering what search terms your target audience will be typing into Google. 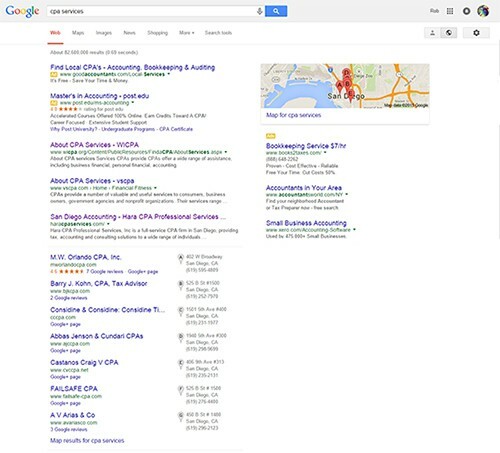 A San Diego CPA, Susan, is interested in optimizing her site to bring in new business. She decides to choose a handful of keywords that she feels makes sense. She decides she wants to target the keyword “accountant” — a very broad term, to say the least. The problem is, people could be searching “accountant” for a number of reasons. Maybe they’re looking for a job. Maybe they’re looking for a definition. Furthermore, a single-word keyword like that is going to be extremely competitive. Susan is therefore going to have an exceptionally difficult time even getting onto the first page. A much better SEO strategy would be for Susan to take a calculated approach to finding the right keywords. First, she determines who she wants to do business with. Who stands to be a more profitable customer for an accounting firm? Individuals or businesses? That’s a no-brainer! Susan knows that businesses need to file their taxes every quarter. Further, they need to have a direct report on their finances every month. With this in mind, Susan comes up with a more specific list of keyword ideas using Google’s Keyword Planner. Her aim is to target search terms that small business owners in her area will be searching for when in need of accounting services. Susan quickly realized “accountant” was not the best choice. More people were searching for “CPA” or “accounting”. What surprised her was the amount of people searching for a “financial advisor”. After finding the most important keywords, she started expanding and refining her list to target searches that are more likely to have buyer intent. Each keyword focuses on services businesses need, which is exactly the type of customer Susan is looking for! These keywords don’t have as much volume, but they are far more targeted. Would you rather have 100 targeted viewers, or 150 that are far less likely to be interested in your product or service? It’s a balancing act and will depend on the number and how competitive any of the keywords are of course. The takeaway? Ignore keyword research at your own peril. In Susan’s example, people searched for “financial advisor” more than “accountant”. While an accountant is definitely a financial advisor, the people using that search term are more likely to be affluent, high-value clients. If Susan is able to gear her services towards prospects like these, she stands a better chance of capturing higher paying clients. Also, there were four times more searches for “CPA” than “accountant”. While the services are basically the same, optimizing for one keyword over the other could mean exposure to four times as much organic traffic. SEO is market research. Good keyword research (especially on a local level) can help you uncover the best phrases to use to describe what you are offering. Why? Because you’re speaking the language of your customers. Ranking “#1” for a keyword that rarely gets searched and stands no chance of sending you buyers is useless. It’s an expensive mistake to say the least. It costs time and money to update your site with fresh content. Further, optimizing your copywriting for SEO is a skill that requires patience and practice. If you’re not targeting keywords that will have a measurable impact on your business, you’ll be throwing away all of that effort! It’s not always about finding a keyword that fits your own expectations. Good SEO is more about selectively choosing keywords that reel in people who want to buy what you have to offer. Here’s what you’re going to do in 5 simple steps. Write down a list of brand, product, buyer intent, and competitor keywords. 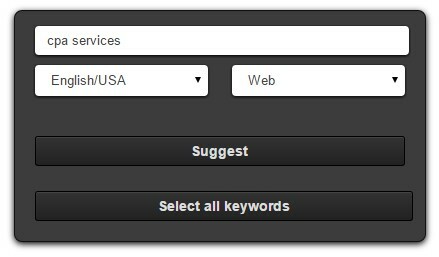 Then separate these keywords into “buckets”. Keep closely related search terms grouped together. There are a couple ways to go about this. 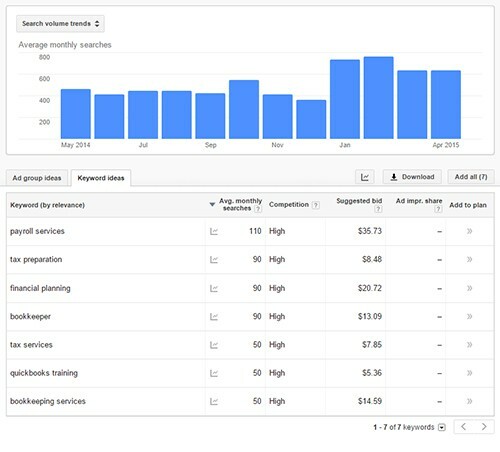 One of the most popular and effective is to leverage Google’s Keyword Planner. To do so, start on Google.com and type in one of your main keywords. I’d opt for using a keyword with buyer intent. Let’s use Susan’s example. You should get a list of competitors occupying the first page for your chosen keyword. 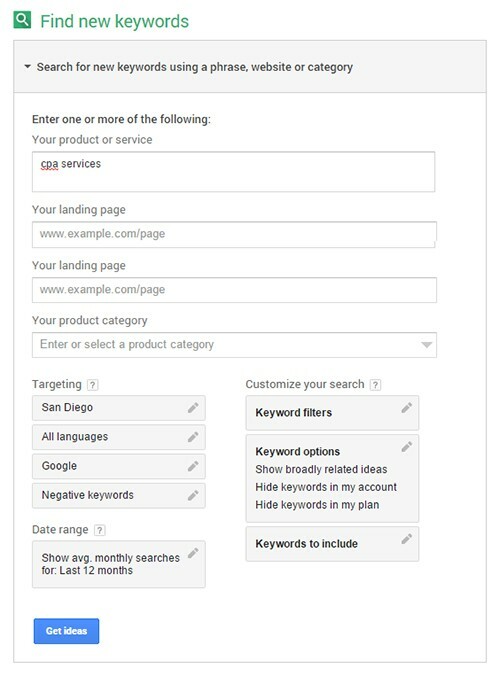 Just copy and paste the domain of a competitor into Google’s Keyword Planner like you see below. You’ll get a list of keywords relevant to that site along with average monthly searches. If the keywords don’t seem to fit, try another domain. Download the results to Excel or Google Drive, then rinse and repeat across a few more competitor domains or landing pages. You can also enter your own keywords to get related ideas. You want to uncover as many opportunities as possible. Doing both will help you uncover more keywords to add to your list. You can also leverage any number of other awesome tools at this stage of your research. Ubersuggest is one of my favorite free keyword research tools. Just enter your main keyword and the tool will spit out a huge list of ideas you can use for your campaign. 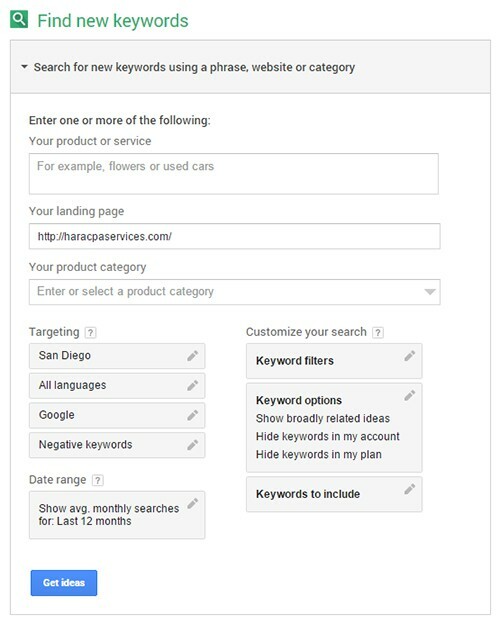 You can then use Google Keyword Planner to vet these opportunities for search volume and ranking difficulty. Hop back over to Google Keyword Planner. This time we’re going to take a look at search volume trends for the keyword ideas we came up with. What you do with this research, is a topic for another day. But we recommend picking keywords with low or medium competition estimates, and decent search volume. As we mentioned earlier, it will usually have to be a compromise in some capacity. The more volume, the harder it will be to compete, and vice versa. You should now have a solid list of keyword ideas to use for your SEO campaign. Be sure to focus your efforts around a tight group of keywords that match your target audience’s buyer intent. And don’t forget that long tail keywords (typically 3 words or more) do bring in traffic and are often significantly easier to rank for. The most important thing to remember is that you’ll need to build a good list from the get go. How you refine it is up to you, but aim for high volume, low competition phrases that buyer intent. Targeting generalized and 1-word keywords is rarely (if ever) the best strategy, especially for a new site. Keep your keywords focused on the phrases people will actually use to find your products or services. As a final note, it’s worth mentioning that with the right approach, you should be able to leverage this simple process using entirely free tools. But there are a ton of tools available, and some of the paid ones are going to offer some truly useful and worthwhile features. If you’re curious, take a look below to see a more complete list of both free and paid SEO tools you can leverage for your keyword research. The alpha and omega of keyword planning tools. You will spend most of your time using this one. It’s free, it’s user-friendly, and it’s chock full of data. There are some minor quibbles that you’ll have from time to time, but overall this is an essential and powerful tool. Check out Backlinko’s Guide if you’re just getting your feet wet. Scrapebox gets a bad rap, mostly because it’s a favorite tool of spammers. It can be used for good as well though! It has a built-in keyword scraper that will really flesh out your research results. It’s even able to pull “suggested searches” from Amazon.com and Yahoo among others. This article by Jason Mun is outdated but serves our purposes well here. It showcases the many useful capabilities Scrapebox has to offer, and explains how to make the most out of them as well. This is a personal favorite, as it offers a ton of functionality that goes well beyond just keyword research. It does come with a pretty substantial price tag for even the entry level plans. But it’s well worth it if you’re going to be doing any regular amount of SEO work. Raven Tools is one of the other big players in SEO space. While their keyword research may not be as in depth as some of its competitors’, it boasts one of the most comprehensive suites available. Having SEO, email analytics, content marketing, etc all in one place is a unique and beneficial solution for smaller firms where each employee is involved in multiple aspects of marketing and sales. If you find yourself disappointed by the vague and hard-to-interpret “keyword difficulty” metrics in some of the other tools listed here, this is great addition to consider. It both analyzes and quantifies the anticipated difficulty of ranking for your desired keywords, and integrates nicely with the rest of Moz’s stellar SEO tools. This article on Wright IMC has an in-depth walkthrough of Moz’s tools that includes some instructions on how to make the most out of the Keyword Difficulty Tool. KeywordTool.io is a solid (and free) alternative to Google’s Keyword Planner. It works fast, it returns more results than Google’s offering, and it’s UI is simple and aesthetically pleasing. Soovle is another simple and straightforward offering, but one that has a really interesting approach to displaying results. It pulls results real-time (while you type) and displays a list of results for multiple search venues all at once. It’s therefore useful for comparing search data between Google, Bing, Yahoo, etc. Digital Vidya has a guide to help you hit the ground running with this free keyword tool. It doesn’t offer anything particularly robust or powerful but it’s free and gets the job done. Worth taking a peak at to see if you’ll prefer it over keyword.io and/or google’s keyword planner. SEMRush is a popular and comprehensive SEO tool for the serious internet marketer. It’s more expensive than most of the other tools listed here, but with good reason. This is a professional offering with very few shortcomings. Check this incredible and in-depth guide published at RefuGeeks. This is another tool that gives users a variety of data including predicted competition, trends, and social metrics. It has a free option so you’ll be able to get a feel (albeit a fairly limited one) for whether or not it’ll be a good fit for you and/or your organization. Marketing jack-of-all-trades, ascendant wordsmith, and self-proclaimed World’s Best Dog Dad. I write about SEO, social media and content marketing. Beginners Guide: Why is SEO Important? The Full Scoop on Google AMP: Does It Boost Mobile SEO? How Can SEO Services Increase My Sales?